It was time to change our base from Jerusalem to the Galilee, and so our day started at 5:00 am because we had things to do and places to see before we set off on our journey. After a light breakfast a small group of us headed for the Damascus Gate to enter the Old City and made our way to the Church of the Holy Sepulchre. Arriving before 6.00 am we found that services had already begun in front of the Edicule (a “little house,” built over the tomb, to protect and cover it), and so we would have to wait to enter until after the service. It’s kind of hard to describe the layout of the Church of the Holy Sepulchre – but here goes – The Church was built originally under the instruction of Constantine the Great, the first Christian emperor of Rome. The church, dedicated in 336 A.D., was said to enclose both the site of Christ’s crucifixion (Golgotha), and the rock-cut tomb in which he was said to have been buried. 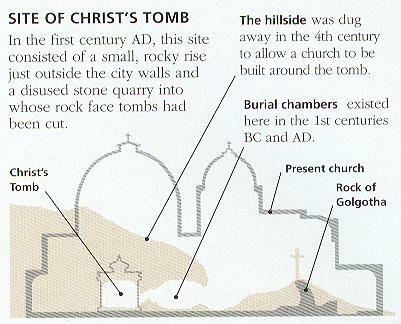 To enclose the tomb, which had previously been covered by a pagan Roman temple, (much the same had been done at the site of Christ’s birth), Constantine’s engineers had to cut away the hillside into which it had been carved, leaving a freestanding plug of rock jutting out into the landscape. The Edicule covers the tomb and sits below the dome. The rock is partially seen (encased in glass), partially hidden (with access to touch it in much the same way as one touched the floor of the cave at the Place of the Nativity). Believe me a diagram helps. 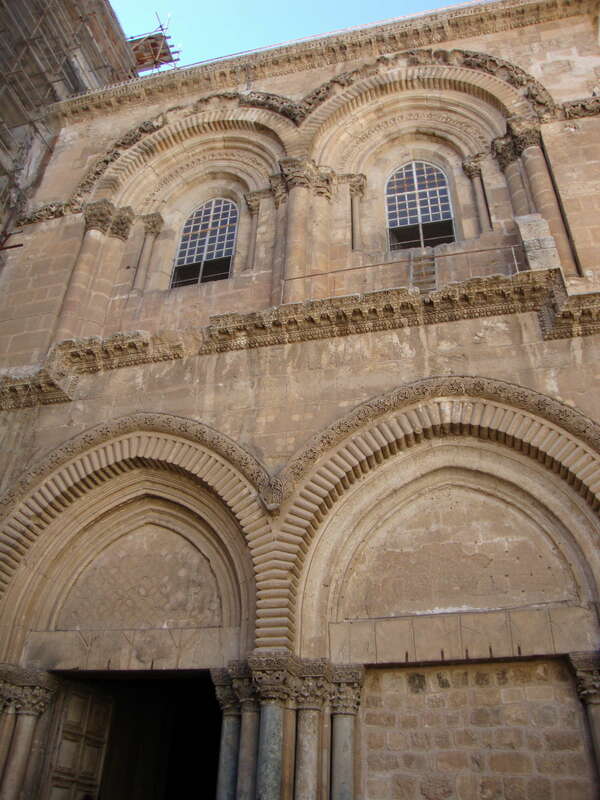 The building was constructed in multiple stages – the Byzantine and Crusader periods being the main times, with various repairs carried out until the 1800s. But strangely enough, not since, due to a treaty that forbids modifications not agreed upon by all six Christian denominations there. A ladder sits against a window and has been there since the 1880s because some things don’t seem to be agreed or resolved very quickly. Six Christian communities share space within the building: the three smallest denominations, with the fewest possessions and the least power, are the Egyptian Coptic Orthodox, the Syrian Orthodox, and the poorest of all the communities – the Ethiopian Orthodox. The three “great” communities, which jointly own the floor of the rotunda (on which the Edicule sits) and the tomb itself, are the Greek Orthodox, the Roman Catholics, and the Armenian Orthodox. The vast building is a series of twists and turns with dark corners, rooms and altars, stairs going down to chapels on lower levels and stair going up to chapels above. 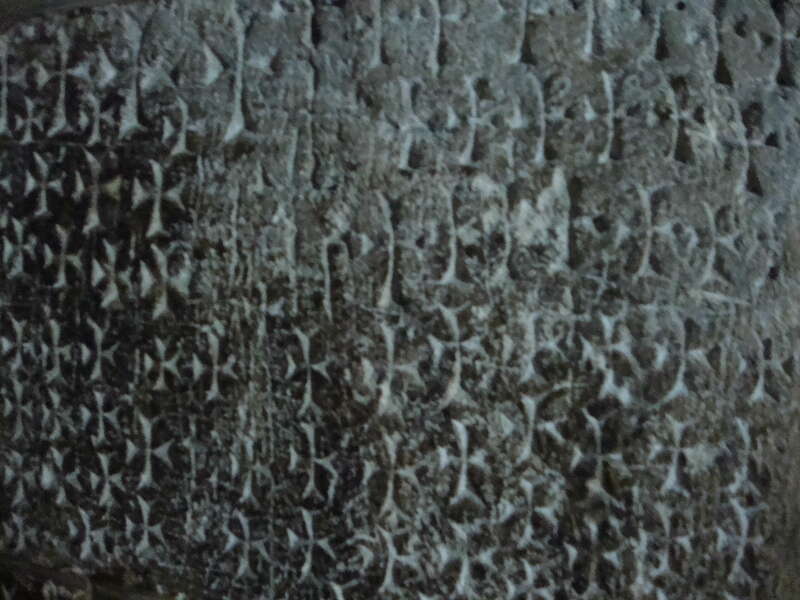 There are first century tombs, paintings, mosaics, lamps, and crosses carved into the walls that date back over 1000 years. In some areas there is the smell of incense, the sound of silence or the hum of murmuring voices, and occasionally an irate monk telling people not to take photos of the alter and the star on the floor through which you could touch the top of the rock, smoothed by the touch of millions of pilgrims.